Made this from the April '11 issue of Food Network Magazine and I would make it again. The recipe seemed rather bland for for the simple makeup of the ingredients but it works! Fast, simple, healthy, and delicious. 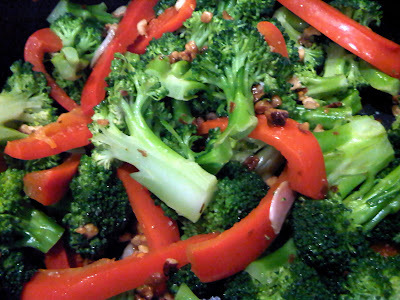 Cook 1 pound broccoli florets and 1 sliced red bell pepper in salted boiling water until just tender, about 3 minutes. Drain and transfer to a bowl of ice water to cool, then drain again. Heat 2 tablespoons olive oil in a skillet over medium heat. Add 1/2 cup chopped walnuts, 2 sliced garlic cloves and 2 to 4 crushed dried red chiles and cook 30 seconds. Add the broccoli and bell pepper and cook 2 minutes. Season with salt. That's it! I didn't have dried chiles so I put in 1/4 teaspoon of crushed red peppers and used gray sea salt to season. Next time I may use garlic salt for added flavor. Hope you like this side dish as much as I do.